Happy New Year, everyone! I’m kicking off 2018 with a post about a city I visited last spring. I hope you enjoy this portrait of Tangier, Morocco. After two weeks in Portugal and Spain, the exotic allure of Morocco has my full attention. It’s been ten years since my last visit to the country but Morocco’s gypsy ambiance has never lost its grip on my heart. We park the rental car at a long-term garage in Algeciras — nearly getting scammed in the process, but ultimately we outwit the jerk who is trying so desperately to usher us into a particular parking space. Basta! He runs off, pretending he’s calling the cops. The car is stored and we’re on our way to Tangier, the first stop on our week-long jaunt through northern Morocco. As we ferry across the Strait of Gibraltar I wonder at the ocean water — apatite blue and as calm as Lake Tahoe. We begin to see the shore of Tangier stretching along our view to the east in a thin, bright line. The light seems magnified, one tiny step closer to the equator, with a palette devoid of the bright greens of the Algarve from where we’ve just come. It’s intriguing to imagine the Sahara desert not too far beyond us … an adventure for another time. At the moment, Tangier is our adventure. The city climbs the hill in front of us like the San Francisco of Africa. 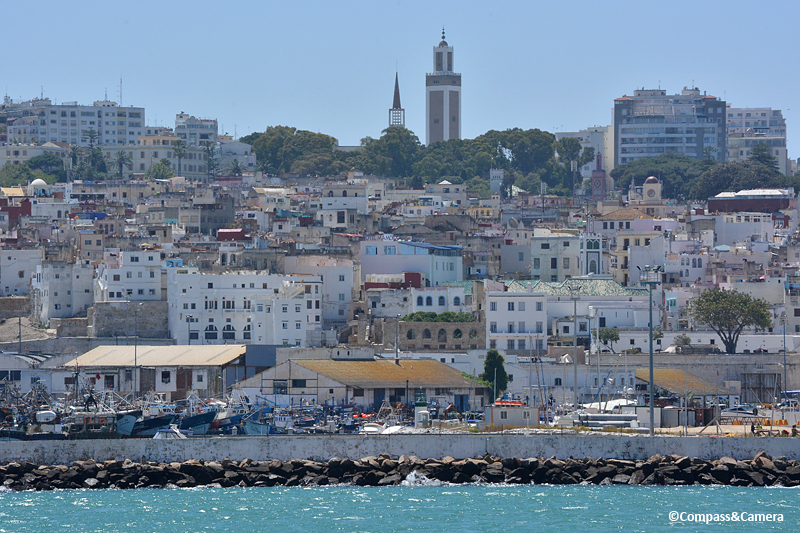 Tangier is a melting pot and crossroads at the edge of the continent; a city of highs and lows as time and people have passed through it for centuries. At the moment, Tangier is revitalized and ready for the future with a huge new port, a beautiful beach promenade and all the culture a city needs to attract an international community. Our riad is somewhere in the middle of this hillside collage. Within minutes of docking we’re in a taxi on our way around the medina. We find our way to the kasbah and arrive at the side street where La Tangerina is high on the hill, tucked behind a grand wooden door. Typical of Moroccan architecture, La Tangerina is several stories tall with a central courtyard. Our room is a small, split-level unit overlooking the walkway out front. 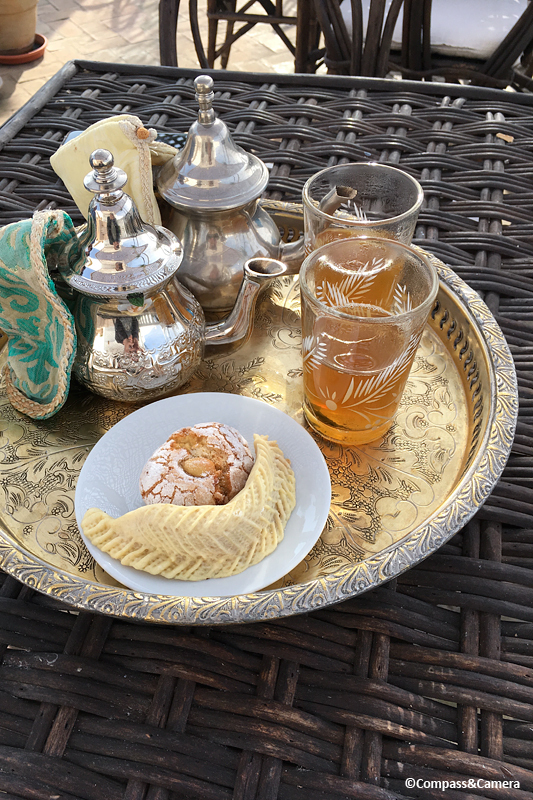 We unpack a few things and retire to the rooftop deck where mint tea and cookies are waiting for us in a stylish assemblage which reminds me that even the smallest things in life can be done with great artistry. We feel sincerely welcomed. We toast to an exciting day, with a view of the Atlantic on one side and the medina on the other. Our taxi driver returns at 5:00 p.m. for an hour-long walking tour of the medina. He’s a university student and earns extra money by giving tours, during which he can practice speaking English. For the next hour we wend our way through the maze of footpaths among the buildings, so tall on both sides it’s impossible to tell where we are. It feels a little like snorkeling — we come up for air and try to get our bearings each time a path emerges into an open space. The medina is a study in textures and colors, and I find myself navigating by the most memorable of them. A yellow and blue wall with a row of plants on a doorstep is a favorite passageway. 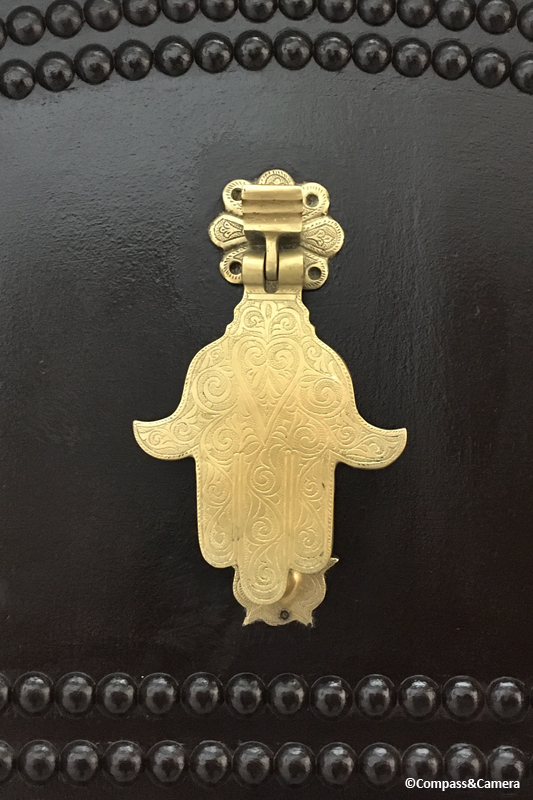 The khamsa, or Hand of Fatima, hangs from more than a few doors as a protective symbol to ward off the evil eye. The khamsa is also a contemporary symbol of peace. What I love most about Morocco is the endless embellishment of even the most mundane surfaces. Walking through the medina offers an endless display of intentional artistry. Doors and windows almost always have elegant, hand-hewn designs within the confines of plain rectangles. As I learned in Islamic geometric design class, the best designs (and most designs here, really) are made-to-measure. The starting point, ending point and placement have been carefully considered to avoid the odd cut, loose end or messy composition. Moroccan design is deliberate design at its very best. The streets outside the medina are wider and easier to navigate, running down to the port and across to the Ville Nouvelle. But old city or new city, temptation exists at every doorway. The crafts, textiles and antiquities inside the shops speak a vibrant, expressive language and the much-loved neutrals of western palettes have little voice here. We step into a shop with room after room of rugs, ceramics and home accessories. Overwhelmed with patterns and choices, the salesman leads us upstairs to share something he seems to know we’ll find of more interest. We emerge on the roof to another perspective of the medina. The midday sun strips the shadows from the mass of shapes on the hill and the call to prayer begins. This moment feels more valuable than any rug or accessory we might have had our eye on so we take it in and thank him for showing us. We explore the fish market as well as the fruit and vegetable market set up along a street in the medina. The bounty of Morocco creates a variety of traditional dishes, including a sardine stew simmering in open tagines at a street-side cafe. At every destination, the reaction to being photographed is something a photographer must explore and be aware of. In Mumbai, people loved being photographed but here in Morocco the general feeling I’ve gotten so far is total aversion. This is confirmed when I talk with a Berber woman about the cheese she’s selling at the market. She’s happy to show and sell her product but dips her hat to hide her face when I ask if I can shoot a photo. No matter — every culture is different and deserving of respect. I find myself shooting almost entirely with my phone because it’s faster and less conspicuous. Even still, and for this reason, most of my photos do not include people. The indoor market holds even more piles, bins and boxes of Moroccan staples like lemons, olives, dates and nuts. For being so close to the Sahara desert, Tangier’s markets look surprisingly plentiful. We stop for an afternoon coffee at the Grand Café de Paris. We choose a table along the back wall and watch the the world go by through the high windows overlooking the street. The brown leather chairs and buttoned-up waiters give an atmosphere of old elegance. No one moves too quickly — this is a place to meet and relax but an air of sophistication holds court over every customer. It feels as if anyone in the world might walk through the door. To end our day we take a walk through the historic El-Minzah Hotel which opened in 1930. The walls are covered with photos of famous people who have come to the hotel including Rita Hayworth and Yves Cousteau. The inner courtyard gives another nod to old elegance. 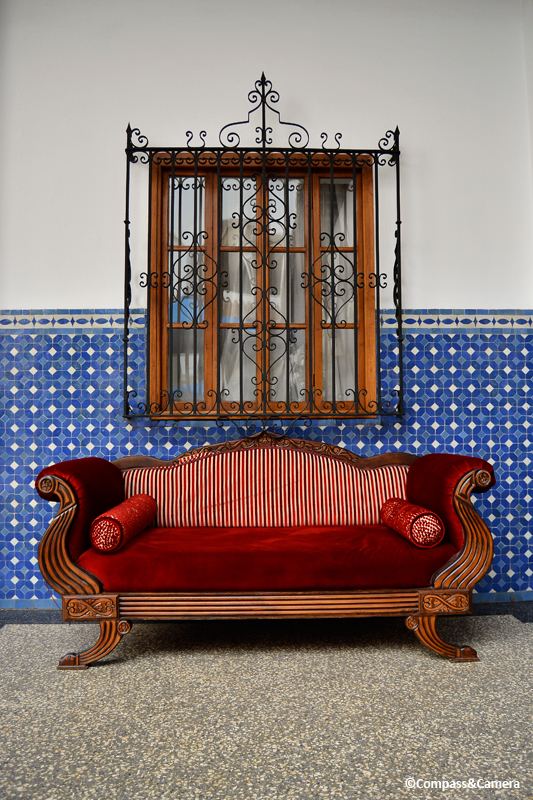 In a quiet corner almost out of view, a bold antique sofa sits against a blue tiled wall under a framework of iron scrolls over a window. It is yet another effortless composition of pattern on pattern, color on color, that creates the singular sense of place that Morocco so clearly communicates. As we end our time in Tangier I capture one more photo of my favorite discovery within the medina. 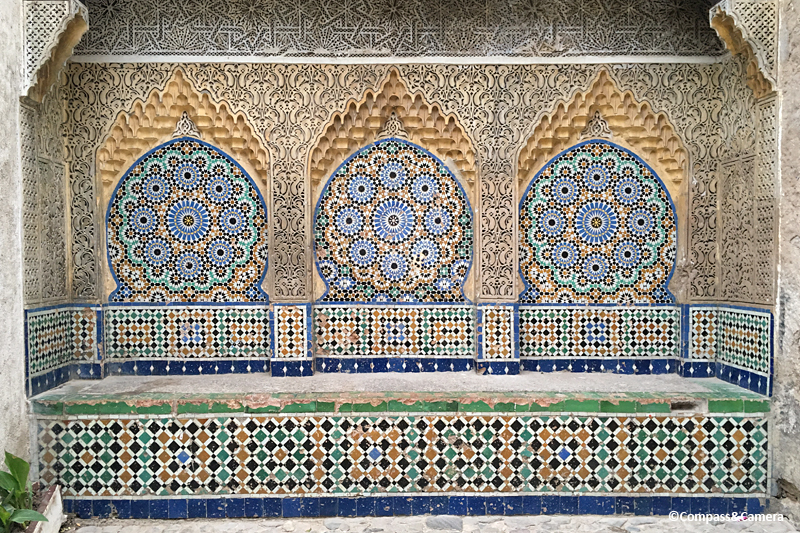 Down a dusty road in an unremarkable spot, this profusion of Islamic geometric design sits in solitude with chips and cracks that show its age — wabi-sabi in Tangier. Perfect, symmetrical, made-to-measure and stunning. It is my favorite discovery of our whole trip. It’s time to catch the train and move on from Tangier. We taxi to the station and make a run for it, reluctant to leave this charming, rustic city. It’s been so fun to explore … and only just a warm-up for the coming labyrinth that is Fez. Well this is a stunning display of text and photos and I ate it all up for my breakfast. It is my morning jolt of inspiration! The colors and the food – my goodness it is all so enticing. This blog is fantastic! Cannot wait for Fez….. Thanks! Happy to hear you found this post inspiring. You would love Morocco! 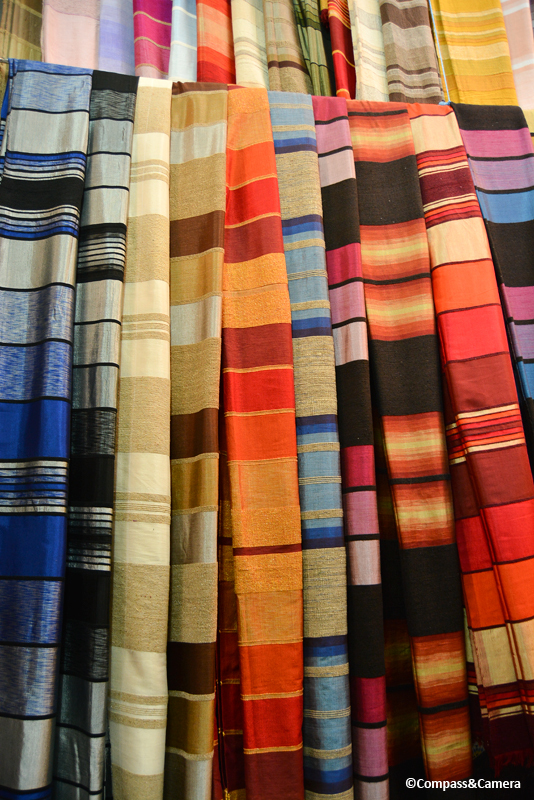 Your wonderful words weave a tapestry as full of color and texture as your favorite Islamic designs. I hope 2018 will be filled with more fulfilling travel. Thank you so much, Tanja! Your message inspires me to travel and write more. Hopefully a lot more this year! Wishing you all the best in 2018! 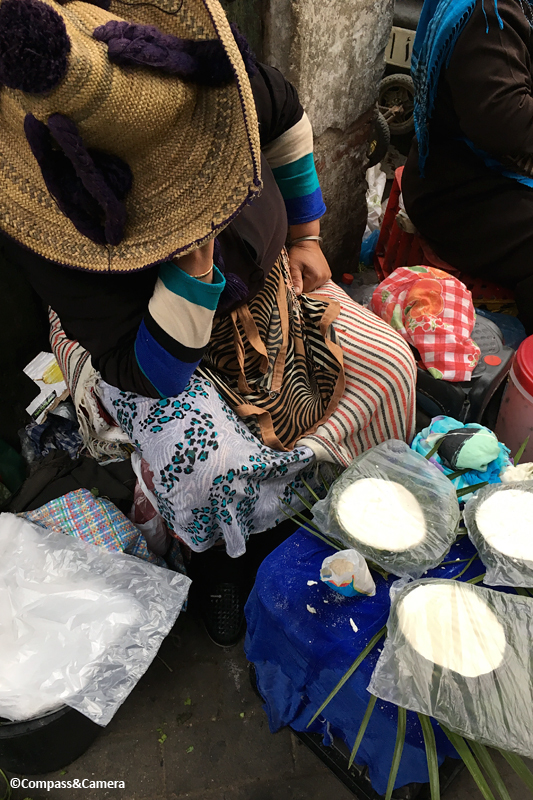 I had but a brief taste of Tangier, herded with the rest of a group of tourist cattle to predetermined shops. Still, the haggle I had for the rug gracing my living room is still memorable. You, on the other hand, have done it right. Steering your own ship, a bit of guidance to help you find those special spots, a truer taste of the culture. On to Fez! What a great trip. Thanks for sharing your adventure and the wonderful photos. Happy New Year to you too Kelly. Thanks, Andrew! More to come. And thanks for the New Year wishes, too! Hope your 2018 is off to a good start! Fabulous images. Happy New Year to you Kelly. Thank you, LuAnn! Happy New Year to you, too! Thanks, Curt! Happy to hear that you could still get a sense of the ambiance of the city. I appreciate your comment! I’d forgotten how well you write. 🙂 🙂 Hoping for a Moroccan adventure of my own one day. The Islamic style of art is a joy to behold, isn’t it? Thank you so much, Jo! Yes, Islamic art is just exquisite, unique and so beautiful. I wish I could cover the walls of my own home! I really hope you arrange a Moroccan adventure for yourself. There’s so much to see and take in. It’s a country I hope to keep going back to. Thanks for reading and sharing your thoughts! LOVE all the colors and warmth of this place and your post. The yellow and blue-walled passageway could be my home forever! Thanks, Lex! I think you would love Tangier and wandering its endless passageways. And the promenade along the beach, although not included here, is also beautiful — reminiscent of Cuba’s Malecón. Overall, it’s a fascinating coastal city. I’ve been dreaming to go to Morocco for a very long time, not only because of its profusion of colors and geometric patterns or its rich history, but also because it’s one of not-that-many countries where Indonesians can visit without a visa. I usually include Rabat, Casablanca, Fez, Marrakesh, and the kasbah of Aït Benhaddou in my dream itinerary. But for some reason I’ve been overlooking Tangier. This post assures me that I really shouldn’t put it aside as the medina, the alleys, the doors, even the shops in the city all look beautiful! Happy New Year, Kelly! May 2018 bring you more opportunities to explore more parts of the world! Bama! THANK YOU for the New Year wishes! Same to you! I hope you have a wonderful year of travel as well! 🙂 I love that you’ve been dreaming of Morocco. It’s worthy of your dreams! Great that you can go without a visa, and I was just commenting to Alison that Tangier is SO easy to get to from southern Spain/Europe (which may be cheaper to fly into than Morocco). I already can’t wait to read your future posts from this amazing country. I’m sure with your unique perspective you’ll find endless history and culture to explore. This is one of those places … desert, mountains, beautiful countryside and incredible cities … you could return again and again and dive deeper every time. Great to hear from you!! Your writing and photography both are so evocative that I long to jump on a plane and go straight to Morocco. Beautifully done Kelly. 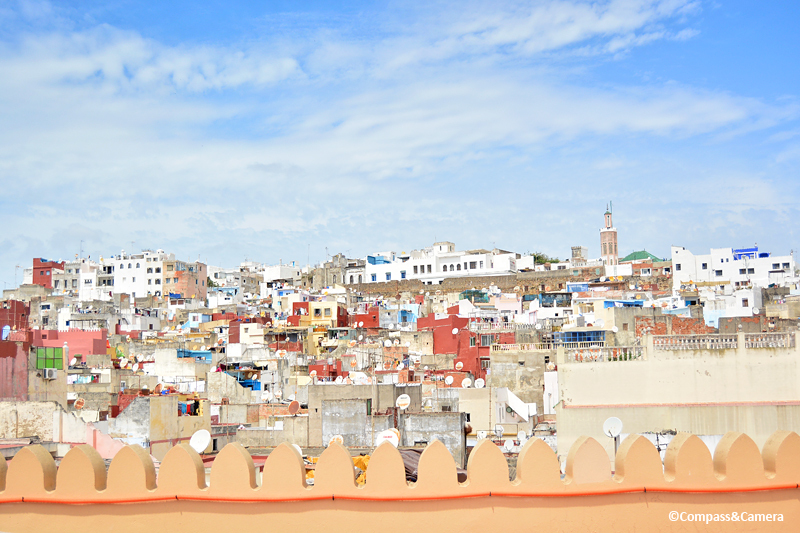 And the one photo of Tangier from the rooftop is just fabulous. Thank you, Alison! A wonderful thing about Tangier is how easy it is to get there. One could easily do an overnight trip (or even go for a long day-trip) from southern Spain. It doesn’t require an entire dedicated span of time. Although once you’re there, it’s truly exotic and very hard to leave. A discovery waits around every single corner. You would love it. Hope you’re enjoying the weekend! Great to hear from you. ~K. Spending the entire weekend at the Canadian Figure Skating Championships. It’s been awesome! Only word I can think of is…. WOW! Perfect! I like that word! 🙂 Thanks, Kevin! What a sumptuous feast this post is! I especially loved the photos of those foot paths; I could gladly be lost in there for days. It’s a wonderful thing to see all of this color and texture. Thanks, Angel! I just posted a new story on Fez — an even bigger, more elaborate city of color and texture. You would love exploring these amazing cities! Colorful delights! I love the Islamic geometric design as pictured in your post. They are so charming! Somehow I missed this post, but scrolling through your homepage that gorgeous tile caught my eye. When you mentioned, “This moment feels more valuable than any rug or accessory we might have had our eye on so we take it in and thank him for showing us.” I found myself shouting, yes, yes, yes! How wise of the salesman. Thanks, Bespoke!! I love it when my words and experiences resonate with deep world travelers like you! Thanks for sharing your thoughts. Hope you’re well wherever you are in the world.